I've checked one of the leading site for buying and selling products and services on Philippines (sulit.com.ph) in search of cheaper Nokia N8s compared to the pre-order SRP price of Nokia PH. 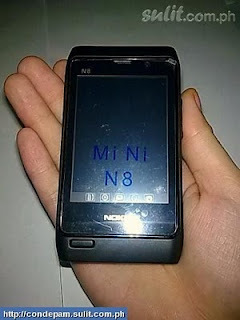 Unfortunately, I saw N8 clones along the way (pictured above). Some people have difficulty distinguishing kirf items from authentic items, and many sellers are taking advantage of it, so here is a list of things to remember before buying your N8 or any other Nokia phones. 5. Dual SIM, nokia offers dual SIM phones but on their low end line of phones only. 7. Of course the brand, some phones are branded Nokla or N0kia to confuse buyers while avoiding possible trademark issues. Just remember, when you're in doubt, No! Thanks to sellers who are honest enough to tell their possible costumers that the phone they're selling are clones or fake. DVB-H will not work here anymore. What the country need is 1seg since NTC adopted the ISDB-T standard. Nokia makes ISDB-T phones and tuners but they only market it on South America and they don't reach the Philippines and Japan. If you want to try 1seg, you can buy Samsung Softbank phones from Japan or the Nokia SU-33Wb 1seg tuner from Brazil. ok. let me clarify, so NTC already adopted the ISDB-T standard and nokia creates devices that uses this standard, and yet nokia opt not to sell those phones here in the philippines and instead offers DVB-H enabled devices such as n92 in the form of myTV in collaboration with smart? weird..
Now is the right time for them to sell ISDB-T enabled phones to get back their lost market share from android and iphone. And lets not forget blackberry phones also that's now getting popular even on non-business people. chinese mother fuckers! why can't they make something of their own? bastards!